The oregano is from my recently started herb garden. I am loving being able to step out on the deck and snip fresh herbs for dinner. Wash all vegetables. Combine garlic, green onions, oregano, and Parmesan cheese in a small bowl and set aside. Slice zucchini and yellow squash and toss with salt and pepper to taste. Layer 1/2 of the zucchini and squash in a baking dish that has been lightly greased. 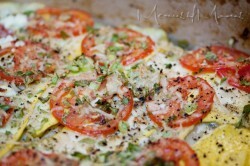 Slice the tomatoes and layer 2 tomatoes over the squash. Sprinkle with 1/2 of the Parmesan cheese mixture. Layer with the rest of the squash, tomatoes, and cheese mixture as before. Drizzle with olive oil and sprinkle with salt and pepper. Bake at 400°F for 30 minutes. Allow to sit for 10 minutes then cut into squares and serve. Pics are gorgeous…making me hungry! I’ll definitely be making this one soon. Thanks, Lila. It was really good – there wasn’t very much left because we all had seconds!